Shahzad Hotel & Restaurant provides economical hotel accommodation in Kharian. Restaurant service is also available. 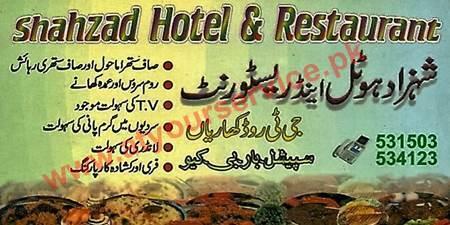 Shahzad Hotel & Restaurant is located on GT Road, Kharian. It provides economical hotel accommodation in Kharian. Restaurant service is also available. Shahzad Hotel & Restaurant in Kharian is an excellent facility for the travelers on GT Road. Stay with us to relax in a comfortable and homely environment. Highly professional, competent and friendly staff members of our hotel and restaurant are waiting for you to be our guest.